Bringing back their childhood days of riding ‘Big Wheels’, man children have introduced a potentially brain damaging new sport called, Trike Drifting. It is a new extreme sport that uses modified tricycles. To launch the trikes, these tri-wheeled Einsteins hang onto ropes and then get towed behind vehicles. Once they’ve reached limb breaking speed, they release the tow rope, and it’s idiot free fall downhill from there. 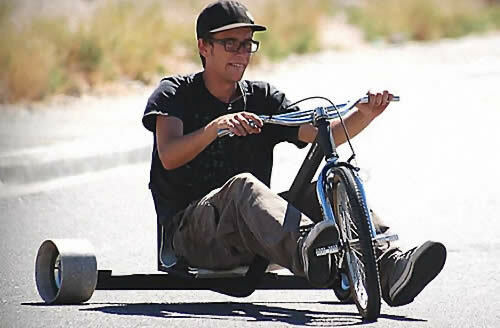 The modified tricycles achieve remarkable speeds, allowing riders to ‘drift’ around corners. Trike Drifting can be a little spooky for spectators though, because the hormonally challenged ‘paraplegic in waiting’ riders are only mere inches off the ground, wearing virtually no protective gear at all, and are travelling at speeds that can best be described as ‘terminal’ velocity.